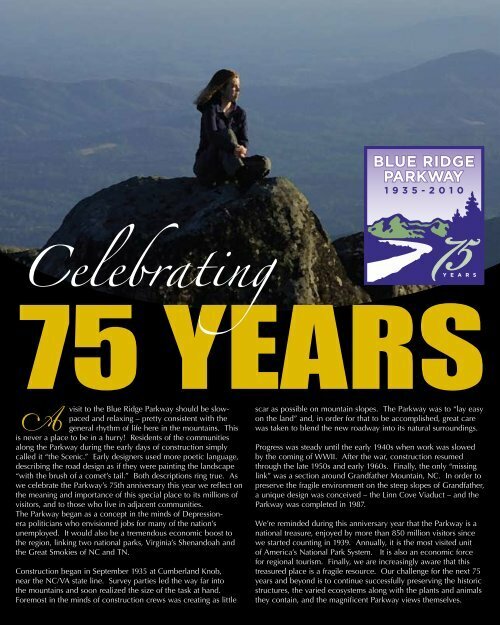 BRINGING THE BEST OF THE BLUE RIDGE TO MILLIONS FOR 75 YEARS! Blue Ridge Parkway Bridge over State Hwy. 80 at Buck Creek Gap Each year, Parkway travel generates more than two billion dollars to the economies of North Carolina and Virginia through tourismrelated activities. Many Parkway communities are planning 75th anniversary events this year, showcasing their rich mountain culture. Spanish and Italian stone masons were employed to complete much of the extraordinary rock work along the Parkway. The Parkway touches boundaries with state parks, four national forests, and five federally designated wilderness areas. Where else in our fast-paced world can people follow one path that reveals so much natural and cultural history? It’s hard to forget a visit to this special place. Browsing through today’s electronic social media websites confirms this as visitors record their thoughts and ideas about the Parkway as well as sharing their digital pictures for the entire world to enjoy. Linville Falls Pisgah National Forest It becomes increasingly clear that the Parkway is a fragile resource as well, known for its biological diversity and a species list that continues to grow. The wide range of habitats and large number of headwater streams provide homes to frequent and familiar plants and animals as well as dozens of rare and endangered species. Assessing the many threats to these resources and developing solutions for them is a daily challenge for park staff. More than ever, Parkway managers are looking for and finding opportunities to work with partners and adjacent landowners to maintain the park’s unique visual qualities and the natural and cultural resources that make this place so special. “Open spaces” and “greenways” are being designed in some communities in order to enhance the visual scene and recreational opportunities. Rail fencing became part of the visual appeal of the agricultural lands adjacent to many sections of the Parkway. The Parkway serves as ‘the high road’ -- a platform to climb up on and look off of, far beyond the official boundaries. To remain America’s Favorite Drive for the next 75 years requires the combined efforts of park staff, park visitors and park neighbors. How can you help? Check out the Issues on pages 13 through 16. Get involved with a Parkway Partner group — see page 18 for more information. And of course, we hope you will visit and enjoy the many special events both on and off the Parkway as we celebrate our 75th Anniversary! General Driving Safety Because of its unique design, the Parkway drive is different than most and this can mean taking some extra care to ensure a safe visit. “Enjoy the view, but watch the road!” is our way of reminding visitors to pay extra attention along the Parkway.  A few specific pointers and facts may help even more. Watch out for… STEEP GRADES – In some places, the Parkway has steeper grades than normally found on highways. Without paying close attention, your speed can increase far more than you expect. UNFORGIVING ROAD SHOULDERS – The Parkway’s road shoulders are narrow in places so that the meadows or forest edges grow close to the pavement. This is, of course, part of the beauty of the drive, but may require some extra attention. BUILT-IN DISTRACTIONS – Wildlife, wildflowers, bicyclists, and extraordinary views… all of these contribute to the Parkway experience and every traveler should be aware of these while enjoying the drive. LIMITED SIGHT DISTANCES – There aren’t many straight lines in the natural world and the Parkway was designed with gentle curves and not many straight sections. This is part of what makes the road seem to lie gently on the land and it also requires some extra attention while driving. SPEED CHANGES – The Parkway speed limit is mostly 45 mph, but occasionally you will find yourself in developed areas where the driving speed drops to 25 mph. SPIRAL CURVES - Some of the tight curves do not have a consistent radius so that extra care needs to be taken, especially on motorcycles. Other Important Safety Advice Hiking shoes or boots are recommended for most trails, especially the more strenuous ones. Steep and rocky areas and slippery stream crossings require extra attention and careful footing. Even for trails marked “easy,” it is advisable to wear flat or rubber-soled shoes for comfort and good traction. Wearing sandals, “flip-flops,” or high heels can result in accidents. Lock valuables in the trunk of your car or take them with you. Sudden changes in weather are common in these mountains. Even in mild seasons, rapid dips in temperature and unexpected thunderstorms frequently occur, and at higher elevations the wind and temperature can carry a surprising chill. Be prepared for weather changes by bringing along suitable clothing. Do not drink the water from streams or springs. Enjoy the View - Watch the Road 6 THE PARKWAY MILEPOST Lodges are located on the Parkway at Peaks of Otter (MP 86) , Doughton Park (MP 241.1), and Mt. Pisgah (MP 408), with housekeeping cabins available at Rocky Knob (MP 175). Lodging & Dining Restaurants, other facilities Pisgah Inn • Treetops and services are available at a number of other locations, opening in mid- or late April. See chart on page 7 for details. Special Information: Mileposts: Along the Parkway, you will see numbered mileposts. The zero milepost marker is at Rockfish Gap immediately south of Shenandoah National Park. Each mile is numbered progressively southward on the Parkway to its southernmost entrance at Cherokee. Our Symbol The National Park Service arrowhead was authorized as the agency’s official emblem by the Secretary of the Interior on July 20, 1951. Created in 1949 by Aubrey V. Neasham, a Park Service historian, the insignia was intended to represent several aspects of the mission of the National Park Service: Its shape and earth-brown background embody our nation’s cultural heritage exemplified in the parks by archaeology and history. The bison and the sequoia tree (symbols from the first two national parks--Yellowstone and Sequoia) represent the diverse natural world of plants and animals included within the system. The snowcapped mountain and glacier portrayed on the insignia’s horizon and the white of the water in its right foreground signify the all-important values of scenery and recreation. The symbol first appeared on a park road sign, then a ranger uniform in September 1952. The icon was registered as an official emblem of the Park Service on February 9, 1965, by the United States Patent Office.